I'll help out as much as I can here. 6 is the Graduation Cap, and 7 is the Graduation Cape. As I find more (and I will, I'm on TamaTown like all day most days ) I will post more. Ooh, I just had an idea. Perhaps we can put in where and when you can find the souviniers as well, that'll help a lot of people. I found the Graduation Cap and Graduation Cape in the school on the rack at the back after I ... well, graduated and got a job. I've found these souvenirs below. The numbers to the right of the souvenir is the item's HEX number. Entering the password for items 10-17 gave me an error. Maybe my Tamagotchi needs to be higher than gen 1.
why dont you try gettin them again? they might be from traveling? There might be other prerequisites to get the items like having a parent or grandparent. I'm not sure yet. I don't think you can travel yet, the site says "Coming Soon" or I'm doing something wrong. I got my V4 about 4 days ago. I figured out how to get the TamaTown site to generate almost any item/souvenir password and GP logout passwords. What's a HEX number? And how did you figure out how to get the TamaTown site to generate any item/souvenir password and stuff? Basically the HEX number on a Tamagotchi is the item's number. Each item has it's own number but it's in Hexadecimal format. I used a packet sniffer to see what webpages TamaTown accesses and took at a look at them. When you're changing areas in TamaTown and it says Loading, your computer downloads the webpage/flash movies and you don't know what files loading. The packet sniffer tells me the names of the files. One file had most of the items (there's some not listed) and their numbers. Usually the item numbers go in numerical order. In hex, numbers start from 0-9 then A B C D E F.
I found out that it accesses another script that takes your User Name and Password and creates logout passwords. You can type in how much GP you want (up to 9900) and what items you want (up to 10 items), after that it'll generate you the passwords like the ones you see when you logout but in plain text. I can create a tutorial later to show you how it worked. omg, that's so cool. Very cleverly done. I can't wait for the tutorial. I'll be interested to see how you did it. This is a really interesting find. Thank you. Which are the 5 travel souvenirs and 3 Kings gift souvenirs from donations. 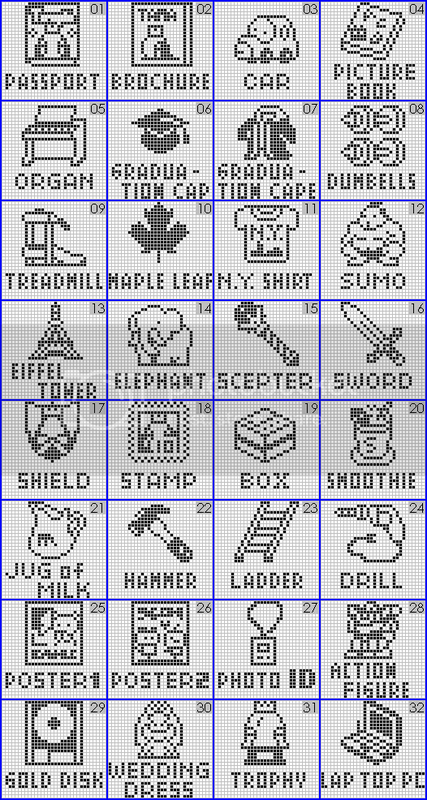 Eight of them are blank (the 5 travel and the 3 King's gifts) because my V4 character currently is a toddler. I'll try again when she becomes an adult. Note: when you click the link, an image will appear scaled to fit your screen. If you move your mouse over the image, the mouse pointer should change into a magnifying glass with a plus (+) in it. (If it does not, click the image first, or press F5.) When it's as such, click the image to see it full size. binary how did you get those souvenirs? I have a couple but not all. For number 10-17 I get the ERROR message. That is because those are the souvenirs that come from the travel tickets and the donations to the king. If you haven't bought and used the 5 travel tickets, or donated to the king then you can't get them. And as The King and travel shop are not open yet on TamaTown, you are wasting your time using the tickets and donating money yet. I guess we can't be too greedy collecting souvenirs from a 'cheat! '.